Join us as we head to the wild new frontier of Cycling! The fringe of Eastern Europe that is opening up to cycle tourism. Experience the iconic cities of Prague and Vienna, but also so much more as we ride beside the mighty Danube, and explore old world Bohemian towns and villages. This ride blends exploration and fantastic riding into one perfect package! 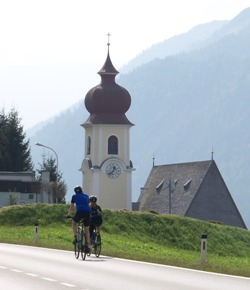 This ride begins from the largest city in Austria - known as the City of Dreams, and the City of Music, perched beautifully beside the Danube River. We shall follow the river to begin our journey northwards - as we cross through beautiful forests and quiet Austrian backcountry to reach the border and our first night in the Czech Republic. Our second day is our longest riding day - so we had better ensure we get underway early, in order that we can savour a beautiful and fascinating cycling day. We shall be exploring small villages, and quiet peaceful forest roads once again - that will lead us through to the historic castle town of Tabor which was founded back in 1402. Doubtless we shall have a very enjoyable night here - sampling Czech Culture, food and refreshments.. The final day is where our anticipation for the grand pinnacle of our ride will reach fever pitch. We join the Vltava Valley - which will bring us all the way into town and to Charles Bridge before heading to our hotel via Wencleslas Square - before we get going on the business of exploring this most beautiful of cities. Up the River Valley of the Vltava to historic Prague - following the river as we ride up to the incomparable and atmospheric Charles Bridge. 4 Nights Accommodation is included in your event. Beginning in Vienna, we will be in simple hotels throughout the event (including breakfasts). The standard of accommodation will fluctuate throughout the trip according to availability - but is designed to be clean, conmfortable and good quality - and will enable us to get a good night's sleep - and continue with the challenge. You will be sharing in twins or triples. If you require a single room then please request this at time of booking (a supplement of £100 will be payable). Transfers to/from Czech and Austrian selected airport. *If booked onto the recommended flight. 3 lunches, snacks and water on route each day. We should catch the best of the summer on this ride - and have warm and sunny weather. Be prepared for hot and sunny conditions - you should protect against the sun with long sleeves available and plenty of cream. Equally however, we could get unlucky! So pack rain jackets and warmer clothes too! Just in case….